Update May 19, 2011: Okay, this has become as easy as hitting the side of a barn with a baseball. Now, more than two years later, Roubini's predictions made late in the financial crisis and documented below couldn't be looking much worse. More importantly, any investors who followed his advice have taken a bath. Since he stated that stocks were engaging in a sucker's rally, U.S. and global stock prices have doubled! Update October 30, 2009: Oil has climbed above $80 per barrel this month so Roubini's January prediction that it would stay below $40 for all of 2009 ain't lookin too sharp just now. And, nothwithstanding this past week's correction, stocks have been strong since late winter...so Roubini's prognostication that this is a sucker's rally also isn't looking too sharp right now. The S&P 500, which he predicted would sag to 600 has surged above 1000. Update March 23, 2009: Last fall, I kept hearing about economist Nouriel Roubini, who supposedly predicted the financial crisis. He was all over the cable television circuit claiming that he had predicted the myriad horrible things that were happening. I wrote the following piece on October 24th because his prediction that hedge fund selling would force regulators to close world stock markets for one to two weeks was absurd. It was indeed absurd and of course, never happened. Roubini was wrong. In researching his past predictions over preceding years, I was struck by how many were wrong. If the economy continues to improve as the year goes on, it will be interesting to see how Roubini will try to explain the myriad negative predictions he has continued to make in recent weeks and months. Some additional recent Roubini predictions which are quite likely to be wrong are his early March, 2009 predictions that the recession will last through late 2010 and his other prediction that the S&P 500 Index was highly likely to fall below 600 (at the time he said this in early March, it was at 676 and rallied strongly since). He has been widely quoted as referring to the stock market rally as a sucker's rally. "Panic over hedge funds could close markets," says the bold headline in The Times, a large London newspaper on Friday October 24, 2008. The article states that Nouriel Roubini, a professor at New York University, told a London investment conference audience that "...hundreds of hedge funds are poised to fail as frantic investors rush to redeem their assets and force managers into a fire sale of assets...We've reached a situation of sheer panic. Don't be surprised if policymakers need to close down markets for a week or two in coming days." Roubini went on to say, "Things will get much worse before they get better. I fear the worst is ahead of us." Those are pretty bold and scary predictions. Telling investors that the worst is yet to come after global stock markets have been hammered down by about half since late 2007 is pretty amazing. Roubini has been getting tons of press of late for having supposedly predicted the financial mess that unfolded in 2008. A recent Bloomberg article said, "Roubini predicted in July 2006 that the U.S. would enter an economic recession. In February this year, he forecast a ‘catastrophic' financial meltdown that central bankers would fail to prevent, leading to the bankruptcy of large banks exposed to mortgages and a ‘sharp drop' in equities." Before I listen to or follow the advice of anyone making predictions, I want to know that person's track record and background. So I researched Roubini's background and his actual economic forecasts (not his claims) and here's what I found. 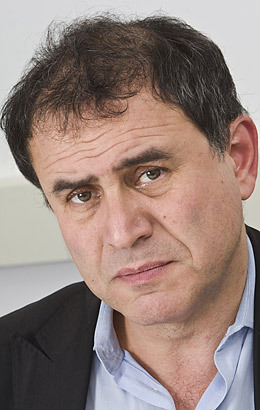 Roubini earned his undergraduate degree at Bocconi University in Milan, Italy in 1982. He grew up in Italy after his Iranian parents moved around to Istanbul, Tehran and Tel Aviv. According to his consulting firm's web site, "Professor Roubini served as a senior adviser to the White House Council of Economic Advisers and the U.S. Treasury Department"
That sounds impressive but on the web site for the NYU Stern School of Business (where he teaches) it says, "He was also the Senior Economist for International Affairs at the White House Council of Economic Advisers from 1998-1999; then, the Senior Advisor to the Under Secretary for International Affairs and the Director of the Office of Policy Development and Review at the U.S. Treasury Department from 1999- 2000." That sounds a lot less impressive. As for Bloomberg crediting Roubini for predicting the current financial meltdown, stock market plunge and recession, some perspective is in order. Back in the summer of 2006, Roubini spoke at an International Monetary Fund event and predicted an imminent U.S. recession according to economist Anirvan Banerji who participated with Roubini in a panel discussion. A transcript of that event shows that Roubini did not predict a market meltdown or any of the other problems he now claims to have predicted as quoted by Bloomberg. Banerji says that Roubini predicted a recession in 2004 caused by U.S. trade deficits, federal reserve interest rate hikes and high oil prices. (His recession calls dating back to at least 2004 is verified by a Business Week article I'll get to in a moment). In 2005, Roubini saw Hurricane Katrina and high oil prices causing a U.S. economic slowdown. "This is a very delicate moment. The economy is already very imbalanced. On top of that, we've had a massive oil shock and now we have a natural disaster that might be something of a tipping point." Here's another quote with Roubini's poor predictions from an article on his own business school's web site: "Among those sporting a red face at Christmas dinner was Nouriel Roubini...Roubini was featured in The Enigmatic Greenback, specifically suggesting the US dollar was in an "anti-gravity" phase that was about to reverse. He has kicked off 2006 with a mea culpa, admitting that he had indeed called 2005 incorrectly. Dispirited? No way. Roubini is back and he's not taking a backward step. 2006 will be the year of the US economic slowdown, and thus the global economy will hit slowdown as well." And, then there's this article from Business Week, which states, "Nouriel Roubini, an economist at New York University who was worried about a global recession in 2004, is now predicting that "the U.S. is heading toward a sharp recession by early 2007." So there you have it. Roubini predicted a recession in 2004, 2005, 2006, and 2007. He was wrong four years in a row. So, in 2008, his prediction appears to be finally coming true. Well, a stopped clock is correct twice each day and as Banerji says, "Roubini is the Boy Who Cried Wolf." So, let's now return to the alarming headline in The Times publication which rattled markets on Friday October 24th with Roubini predicting further plunging stock prices from already low levels and panic so bad that regulators would close stock markets for one to two weeks. Let's think about the premise of his prediction that "...hundreds of hedge funds are poised to fail as frantic investors rush to redeem their assets and force managers into a fire sale of assets..."
Consider who invests in hedge funds and how hedge funds invest money. Hedge fund assets primarily come from institutional investors (e.g. large university endowments, corporate pension plans) and wealthy individuals who typically invest one million dollars or more. Hedge fund investors aren't stupid and aren't going to head for the exits in unison. Also consider the fact that many hedge funds sell stocks and other assets short so that when prices fall, as they have in 2008, they profit. Are investors pulling money out of some hedge funds with which they are dissatisfied with performance? Of course that's happening as it does with other investment vehicles such as mutual funds or exchange-traded funds. That's not going to lead to a further collapse in already highly depressed stock prices. Money management is a highly competitive business and chronically poor performing firms get punished with redemptions and better performing companies get rewarded with more money to manage. For sure, some hedge are liquidating assets which adds to the selling pressure in various marketplaces (or buying pressure if they are covering short positions) as particular hedge funds are closing up shop while some others are seeing assets go out the door. All assets have to go somewhere and smart money managers buy sound investments that are selling at favorable valuations. The sad part about hyped articles with hyped predictions is that it causes some individual investors to panic and do the wrong thing - selling good assets like stocks at depressed prices. The media shouldn't irresponsibly publicize hyped predictions, especially without clearly and accurately disclosing the predictor's track record. Don't fall victim to such hype.